Striking blotches of olive over a paler background, like army camouflage. No webbing on toes or fingers. 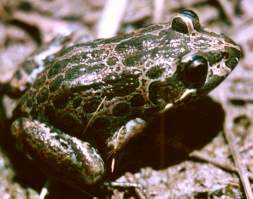 Call is a loud, high, fast and nasal "bunk"
The average adult length of the Marbled Frog is 55 millimetres. Often found calling from hiding under plant debris, and clumps of snagged grass. Found off roadside verges. Common in Darwin and the upper tropics, not extending far inland. Some specimens have apparently been found in Darwin with dorsal spines!